This is the version history (often also called changelog or release notes) for our iMacros Professional and Enterprise web automation solution, including iMacros for Internet Explorer. There is a separate changelog for the iMacros for Firefox and iMacros for Chrome browser addons. Older versions are available for customers to download via their Ipswitch Community account or upon request. An iMacros Code Color Styler that allows you to set the highlighting colors for the iMacros code. The settings are saved in an xml file that can be transferred and used on other iMacros installations. Improved: iMacros and iMacros Editor now use only FIPS compliant, AES-256 encryption. Encrypted macros and passwords using previous versions can still be decrypted, but in a non-compliant way. Improved: Use !PLAYBACKDELAY (continuous) instead !REPLAYSPEED in settings - global and as macro command. The current value of !PLAYBACKDELAY is added to recorded macros as a comment. !REPLAYSPEED is still supported in macros. 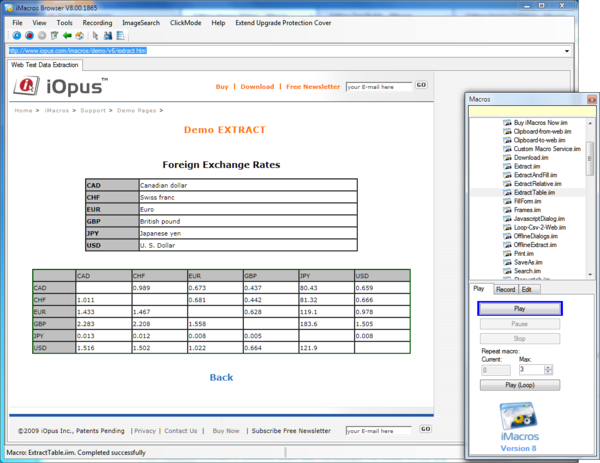 Fixed: iMacros reports wrong EPM value (IE11). Usually associated with failure of making page screenshots and perform any Image Validation tasks in IE11, Windows 10. New: Selenium Integration. 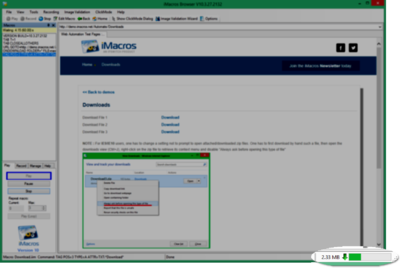 iMacros Editor can now export iMacros macros to Java Selenium WebDriver code. Use any iMacros (for Chrome, for Firefox, for Internet Explorer, or iMacros Browser) to record elements on a webpage and export the commands to Java Selenium code directly from the iMacros Editor. 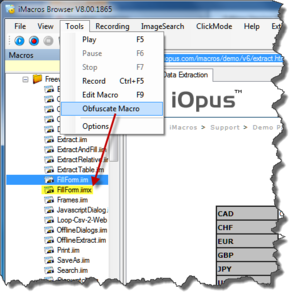 Added: ability to change the iMacros browser emulation on the UI in iMacros Browser. Show emulation mode on status bar and troubleshooting form. Added methods to do the same in the iMacros Component, GetBrowserEmulationMode() and SetBrowserEmulationMode(), as well their use is shown in the C# sample code. Added: command line parameter -title to change window title of iMacros Browser and iMacros for IE (imacros.sidebar.exe). Use Keyword #PID# to set the title (from command line or iimOpen) as "iMacros PID:<pid>", where <pid> is the current process Id. Use variable !WINDOW_TITLE to set title from macro (no read access!). Use iimSetWindowTitle to change window title at any time between playbacks from scr. interface. Added: remaining !FOLDER_XXX variables. !FOLDER_DATASOURCE (read/write), !FOLDER_DOWNLOAD (read/write), !FOLDER_MACROS (read-only), !FOLDER_LOG (read/write). The variable is overwritten only during the macro runtime. Improved: demo macros and example scripts, including a Powershell example script. Fixed: Download not being handled when iMacros browser doesn't have focus. Fixed: Some elements of the Kendo UI (web library) not working with the iMacros browser. Needs registry setting SetPointerEventNull to turn feature on. Fixed: EVENT command does not scroll to the found object. Set element coordinates after localizing the element via EVENT, to allow using !TAGX and !TAGY with EVENT as well. Fixed: Respect !ERRORIGNORE when throwing NoDialogHandler=1450. Don't stop macro, but write message in log file. Improved: Do not display waiting for image search thread. Fixed: iMacros crashing attempting to display the troubleshooting info. Fixed: Trial version reporting trial expired when installing after iMacros for IE freeware has been installed for more than a month. Fixed: SI error -4 message still referring to iimInit (correct method name is iimOpen). Fixed: Scripting interface not compatible with Kaspersky Anti-Virus 2015 on Windows 8.1 in Scripting Interface binaries version 10.2.0.124 and iimRunner 10.2.0.1101. Fixed: Relative positioning not working properly after updating to iMacros 11.0. Fixed: Encrypted macro files (.iimx) not showing up in the macro list on some systems. Improved: Associate iimx files to iMacros. Improved: Edit disabled for encrypted (.iimx) macros. Fixed: Download manager downloading HTML source code rather than target file and new DL manager downloading 0 KB file. iMacros now detects whether the download is the result of a POST and falls back to IE's default download manager. Fixed: File appears to download but can't be found on disk. Fixed: New download manager saves file using temporary file name. Added: TAG SELECTOR command, to localize element using CSS selectors. Fixed: Many more smaller fixes and improvements! Fixed: examples and demo macros not being installed for non-admin user. Samples now have their own installer which is called at first time use. Rewritten download manager, better suited for mass-downloading, web performance monitoring and load testing. Web scripting: File size and name are returned in the variables !DOWNLOADED_SIZE and !DOWNLOADED_FILE_NAME, respectively. The new variables are supported in the iMacros Browser and iMacros for IE. We plan to support in Firefox and Chrome asap. iMacros Browser download manager - note the progress bar in the bottom left corner. No more pesky download dialog boxes appear during macro replay. Fixed: Maintenance release, some bugfixes and minor tweaks. New: added 64-bit version of iMacros Sidebar. There are now two different installers, one for x86 systems and another one, with all 64-bit iMacros components, for x64 systems. Because of these important differences in the installer, notice that an uninstall might be required when upgrading. 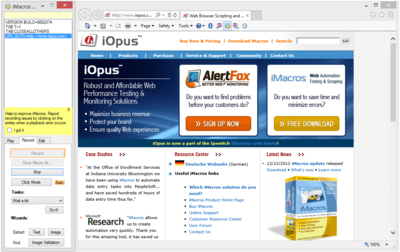 Improved: iMacros Sidebar is now fully compatible with IE's Enhanced Protected Mode. Improved: added support for HTML5 new input types (search, email, range, etc). Removed: iMacros Plugin in Windows running Vista and above. Use the iMacros Sidebar for all Internet Explorer versions. The iMacros Plugin is only available in Windows XP. Fixed: iMacros fails to record content for some text fields. Fixed: scripting interface iimGetStopwatch for Fx and Cr exception when index was out of range. Also enables iimGetPerformance for Cr. Fixed: Changed location of iMacros Browser crash reports to iMacros Logs folder. Usability hint: With the iMacros Sidebar, the icon in IE only opens the Sidebar. To close the Sidebar use the close button in the Sidebar itself. 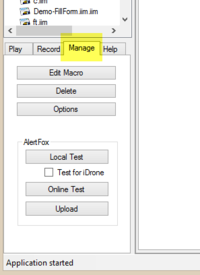 New: Built-in AlertFox website monitoring integration - create and manage web transaction tests from within iMacros. Fixed: Image Wizard not replacing spaces by <SP> in the "Send MouseClick & Text"
This version is now built using the .NET 4 framework. New: iMacros.Sidebar.exe accepts all command line options as iMacros.exe (including tray, silent and kioskmode! ), plus –iePrivate to start IE InPrivate Browsing mode. 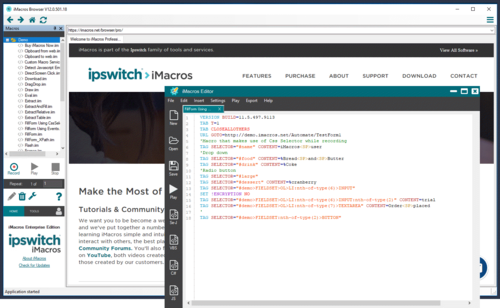 Use –ie_ext to call iMacros.Sidebar with the scripting interface. Note: iMacros 9 is not yet supported on Windows XP, the installer will automatically install iMacros 8 instead. Changed: Due to several incompatibilities, we were forced to remove tab support for IE8. Only IE9, in systems after Vista, have tab support now. Added support for IE9 Browser Confirmation Dialog: "Do you want to close this window"
Changed SET !EXTRACT to clear values before adding new value. Fixed DS not yielding control back after pause or popup. Distribute your macros while protecting their source code. Encrypted macro files have the +.iimx extension. Dock the sidebar on the right also, or put it to "float", if you need more space. The new extraction wizards (text and image) can also be docked at any side of the browser, or drag it away to "float". 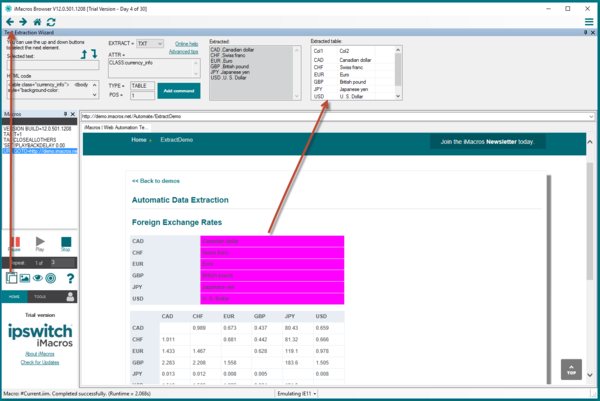 Improved: Embedded tables are properly formatted on extraction. Enhanced: Profiler log file includes timezone identifier in start/end times for easier parsing by external programs. Added: Full support for Certificate/Security dialogs in all current Windows versions. Added: Internet Explorer tabs support also for IE8 on systems above Vista (Vista, Windows 7, Windows 2008, and Windows 2008 R2). This page was last modified on 23 November 2018, at 15:39. This page has been accessed 594,601 times.